Relatives reacted with anger as the news emerged. 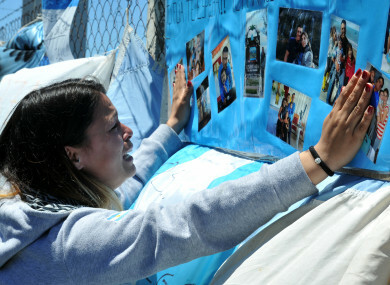 ARGENTINA’S NAVY CONFIRMED yesterday that an unusual noise heard in the Atlantic near the last known position of a missing submarine appeared to be an explosion, dashing the last hopes of finding the vessel’s 44 crew members alive. “An anomalous, singular, short, violent and non-nuclear event consistent with an explosion,” occurred shortly after the submarine’s last communication, navy spokesman Captain Enrique Balbi told a news conference in Buenos Aires. After days of false hopes, some of the relatives said the navy had withheld information about the sub and lied to them over the past week. “I feel cheated,” said Itati Leguizamon, whose husband German Suarez was a sonar operator on the ARA San Juan. They did not tell us they died. But they tell us they are three thousand meters (9,800 feet) deep. “They lied to us,” said Leguizamon, a lawyer. A sobbing Jessica Gopar, whose husband was an electrician aboard the San Juan, said “they just told us that the submarine exploded”. She spoke as she came out from the sub’s base. “He was the love of my life, engaged seven years before we got married,” Gopar said of her husband, Fernando Santilli. And how can I tell my son that he no longer has a father? The San Juan, a 34-year-old German-built diesel-electric submarine, had reported a battery problem on 15 November and said it was diverting to Mar del Plata, but did not send a distress signal, according to the navy. Balbi admitted on Wednesday that the situation for the sub and its crew appeared to be worsening. However, he refused to speculate at that point on the origin of what he initially described as a “hydro-acoustic anomaly” detected in the ocean almost three hours after the sub’s communication and 50 kilometres north of its last known position. Balbi explained that information about the unusual noise only became available on Wednesday after being relayed by the United States and “after all the information from all agencies reporting such hydro-acoustic events was reviewed”. Explaining the lack of debris on the surface, Balbi said “nothing will end up floating to the surface” because a submarine “implodes”. Gustavo Mauvecin, director of the Center for Hyperbaric Medicine at Mar del Plata, said hydrogen “is always an issue with submarines with electric engines”. The San Juan “has 500 tons of lead-acid batteries, which release hydrogen if there is an overcharge in the battery. Hydrogen in contact with oxygen is explosive”. “In my opinion, after an explosion like that, it’s difficult for there to be survivors,” a former submarine commander told AFP. The newspaper La Nacion said one hypothesis is that there was a short circuit in the batteries. It said this would explain the sub’s failure to communicate and the fact that it did not have time to send off a distress signal. The commander said a problem with batteries, as the sub had reported, could in fact cause a blast. “A severe problem with batteries might generate hydrogen. Hydrogen above a certain percentage is explosive,” said the commander who requested anonymity. Horacio Tobias, former chief of diving for the San Juan, said it “was so violent that they would not have had time to realize what happened”. The San Juan would have had enough oxygen for its crew to survive underwater in the South Atlantic for seven days since its last contact, according to officials. That time had elapsed by 7.30am GMT Wednesday. Argentina is leading an air-and-sea search to try to still find the sub. It is getting help from several countries now including Brazil, Britain, Chile, Colombia, France, Germany, Peru, Russia, the United States and Uruguay. The weeklong search has focused on the sub’s last known position, around 200 miles off the Argentine coast, but has been hampered by bad weather. Putin offered “words of support over the situation with the San Juan submarine” in a phone call to Argentine President Mauricio Macri late on Wednesday, the Kremlin said. Email “Relatives angry as 'explosion' dashes hopes for missing 44 on board submarine”. Feedback on “Relatives angry as 'explosion' dashes hopes for missing 44 on board submarine”.